This is for sale in Sweden, 4726€. 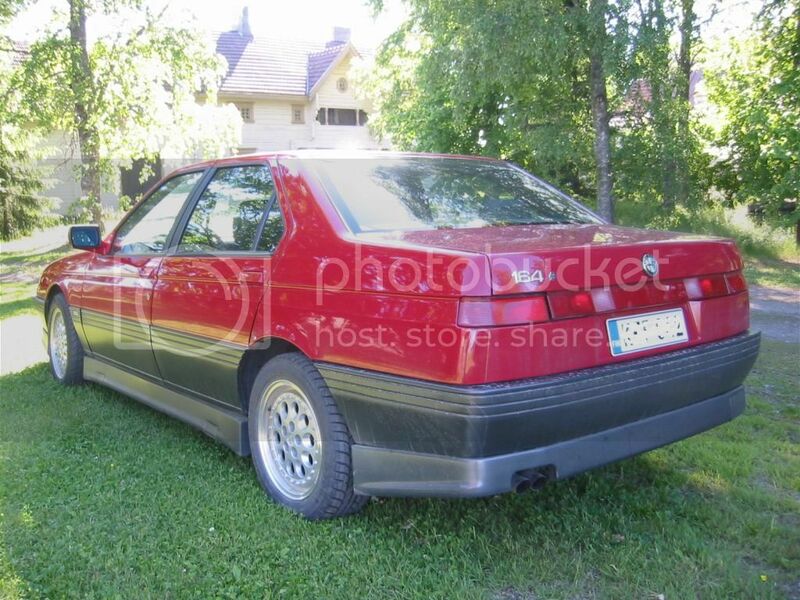 En utsökt Alfa Romeo 164 Q4 med 3.0 l V6 på 231 hk och permanent fyrhjulsdrift. Bilen är i ett perfekt skick, endast några små stenskott på huven, ingen rost eller bucklor. Klädsel och stolar är felfria, nästan nybilskänsla på denna bil, motor och låda går kanonfint, en riktig raket för vintervägarna. Bilen har idag Schweiziska papper, då förre ägaren avled men hade sommarställe i sverige. Så ursprungs kontroll och regbesiktning i sverige är möjligt. Den sista riktiga alfan som byggdes. Alle in allem ist das ein echt sehr sehr schones gepflegtes Auto für einen fairen Preis. Lieferung muss gesondert vereinbart werden !! Interesting and not too far from where I live. However, some rusty parts, eg. in engine bay and brake calipers indicate that the car may have been sitting for some time. Exactly the same parts as on my qv after sitting in a cold shed for seven years. So some expensive maintenance is probably due. How about vat? If it is with Swiss papers and the previous owner being Swiss, would I have to pay vat (24% for me) on top of the purchase price before being able to register it? Of course we have the stupid car tax here too..
Too bad I have promised my wife I get the qv on the road before investing in another 164. Otherwise I would definitely be doing some serious haggling with the seller. If I understand the description correctly (but not knowing the VAT laws of Sweden! ), it says that it also has Swiss papers and is therefore sale-able/can be registered in Switzerland, but that sentence implies that the car comes with the regular Swedish papers as well and should therefore not be subject to VAT. It is true that in German it says "also". From the Swedish text I got the idea that it has Swiss papers and has not completed the Swedish registering process. Please someone correct me if I'm wrong as Swedish is not my first or second strongest language. I looked at the number plate in one of the photos (GEE 622 from what I can see) and it seems to be a Swedish plate. The text says, that the car has Swiss papers, but can be approved for Swedish plates, so I am guessing it is officially Swiss at the moment.